Training The Detail Muscles With Isolation Exercises, To Build A Complete Physique. The basic (compound) bodybuilding exercises are rightly regarded as foundational movements that build the most amount of mass in the shortest possible time. Find out what they are and how they can help you! The basic (compound) bodybuilding exercises are rightly regarded as foundational movements that build the most amount of mass in the shortest possible time. 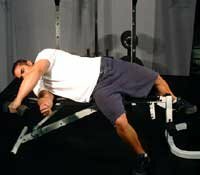 However, sticking with these movements at the expense of the so-called isolation exercises might result in a physique lacking in quality and advanced muscle detail. Take, for example, biceps/upper arm region. Standing barbell and dumbbell curls have served as key movements for this group of muscles since time immemorial. Often they are all one does to train this often-stubborn grouping. However, by adding two additional movements, preacher curls and hammer curls (which trains the brachialis as well as the biceps to add thickness to side of the arm), a further inch can be gained on the upper arm within weeks. Furthermore, the biceps will take on a more refined look with greater shape, thus creating an illusion of greater size. Preacher curls will enhance the biceps peak and ad fullness, while hammer curls will create greater brachialis density. This is but one example to show the impact isolation exercises can have on a specific muscle grouping. The same principal applies to the rest of the physique: to create detail a greater selection of exercises should be used. The key is to strategically incorporate isolation exercises with the more important mass builders. A good rule of thumb for beginners is to use one isolation movement for every two mass building exercises. More advanced trainers might use more isolation exercises, especially during a contest preparation phase. However, the mass builders should never be neglected. This article will provide a look at what exercises are needed to bring out greater detail in all main muscle groupings, while providing a program that can be used to create a complete physique with advanced muscle refinement. Before providing guidelines on what isolation exercises might be used and when, it is first important to clarify which mass builders should be used in a good bodybuilding routine. To effectively target all aspects of the chest it is important to use a variety of movements. Seen from the front or side, chest development can make or break a competition physique, as any weakness in this area will be readily apparent. 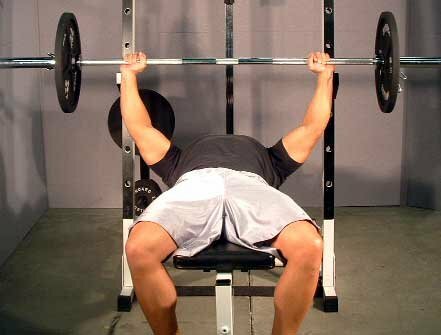 The mass building exercises mentioned above should form the basis of a chest workout, to build the muscles to their fullest extent. 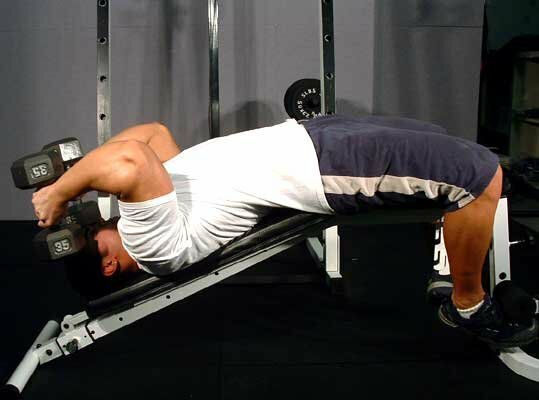 However, detail in the inner, outer and lower pecs can be further enhanced with several isolation exercises. The cable crossover would be one of the most effective ways to carve out detail in the inner and lower chest region. 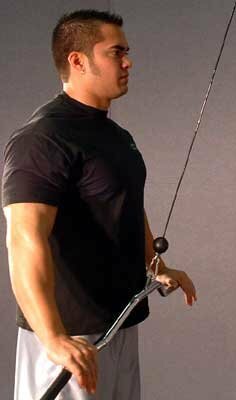 The key with this exercise is to fully extend the arms back (while holding a cable attachment in each hand) before bringing the cables together in front of the midsection for a full squeeze. This exercise will help to bring out the sought after separation that divides each pectoral. Used to develop outer pec flare, the wide-grip bench press will help to enhance chest width. Use a lighter weight than would normally be used with a standard bench press, and adopt the widest grip possible that will allow for a full extension. To broaden the lower chest and develop mass in this area, the decline dumbbell press is one of the best exercises available. 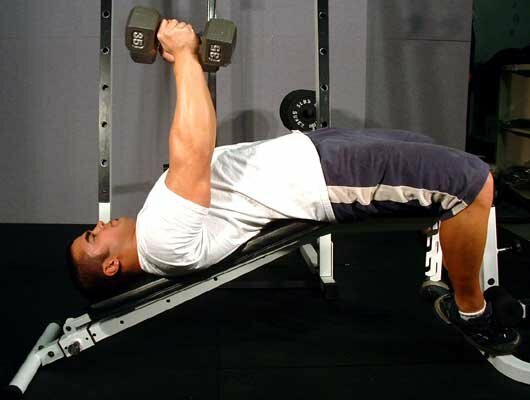 Lie on a decline bench with two dumbbells positioned at lower chest level. Press dumbbells towards upper thigh area and squeeze to contract the lower pecs. Massive shoulders accentuate the V-taper and are arguably the most important muscle group from a muscle symmetry standpoint. However, big shoulders that lack detail will probably not win a contest, so it is important to target the frontal, medial and rear deltoids equally with specific movements. 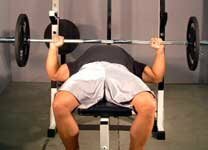 This exercise really develops the rear shoulder cap and is used by virtually all bodybuilders wanting to build this area. As opposed to other rear deltoid exercises, it allows for heavier weights to be used while isolating this area. Bend over with torso parallel to the floor while holding dumbbells straight down. Raise dumbbells to shoulder height and repeat. This exercise helps to ensure constant tension is kept of the frontal deltoid as the weight is raised in strict fashion - with no swinging. Stand with the opposing hand on hip, hold the cable and pull upward while keeping the body (and arm) as straight as possible and repeat. A previous favorite of Arnolds, this exercise successfully isolates the rear deltoid, possibly even more so than the bent over dumbbell raise, as it requires a greater degree of effort on the upward phase, and prohibits excessive body momentum. 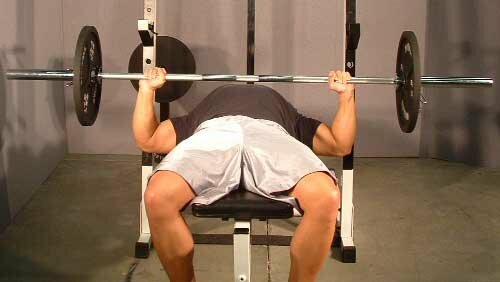 Lie on a flat bench with shoulders perpendicular to the bench, extend the weight out toward the floor before raising it directly above. Return weight slowly. Also can be used to focus all the attention on one specific region. Place opposing hand on hip or hold a stationary object, raise weight and while keeping tension on the working muscles. This one builds the impressive cap that adds width to the shoulders, and accentuates the X-frame. While bent barbell rowing and chin-ups and their variations build size and width to the back, other exercises are needed to help add detail and bring out the separation. A back showing fully developed smaller (detail) muscles in addition to the larger ones will dramatically distinguish itself onstage. The following isolation exercises can be use to carve detail throughout the back. This movement keeps tension specifically on the lat muscles, allowing for greater definition to be etched and for greater growth in these specific muscles. Keeping the body as straight as possible—in a standing position—grasp a lat pull-down bar (with arms straight) and pull toward the floor, until it is almost touching the upper thigh. Return and repeat. A great exercise for adding detail to the inner back, from the lower portion up to the trapezius. As opposed to the barbell row, which builds overall thickness, the two-handed dumbbell row will more fully isolate the all-important rhomboids (these can be seen lying just outside the inner back region). 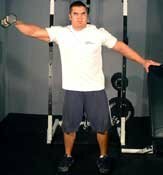 To perform grasp a dumbbell in each hand while bending until upper body is parallel to the floor. Be sure to lower dumbbells all the way to a full stretch, before pulling them toward the abdominal area for a maximal contraction. Be sure to squeeze hard to incorporate all target muscles. The lower back (erectors) is an important, although often neglected muscle group. It plays an important role in stabilizing the core region and for injury prevention to the lower spine (lumbar area). From an aesthetic viewpoint the erectors add thickness to the lower back and provide that sought after Christmas tree effect. 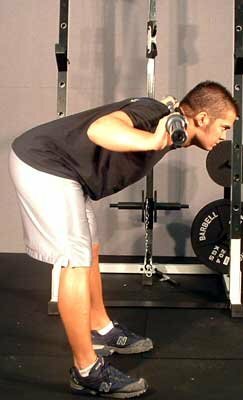 The stiff-legged good morning exercise probably isolates the lower back better any other, as it does not involve the hamstring/glute region to the same extent a hyperextension or deadlift (good lower back mass builders) would. 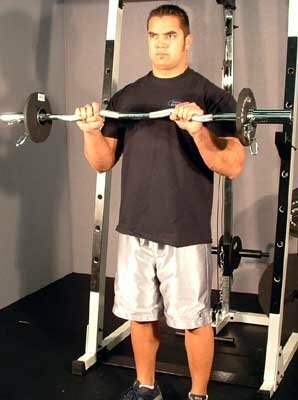 Place barbell across the shoulders and with legs straight, bend at the waist until upper body is parallel with the floor. Return and repeat. A larger muscle than one might think, the trapezius covers the back of the neck and runs mid way down the inner back, where it attaches to the spinal area. Failure to directly isolate this muscle might result in a narrow incomplete look from both the back and front, such is the degree of thickness it lends from both angles. The behind the neck barbell shrug (Lee Haney style) isolates the entire trapezius area to an enormous extent. From the front, shrugging will mainly target the upper trapezius, whereas from behind front, inner and lower trapezius will be hit equally. Grab barbell from behind back with an overhand grip and pull over the glutes until bar is almost touching the lower back. 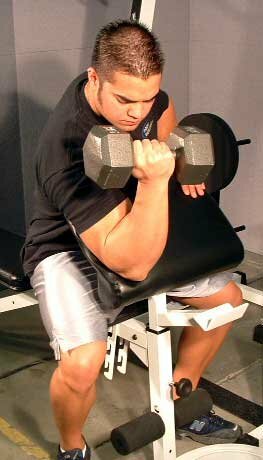 The one arm preacher curl is one of the best, if not the best exercise for targeting the all important biceps peak and adding fullness. A biceps without a sufficient peak will look flat and small, especially if the shoulders are well developed. 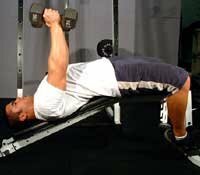 Take a dumbbell and, on an incline bench, position arm over the top of bench to a full extension. 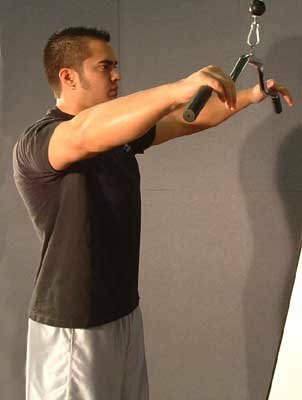 Curl weight and supinate (turn outward from body) wrist upon contraction to achieve maximal peak tension. The hammer curl is a valuable exercise for adding fullness and width the upper arm, as it targets both the biceps and brachialis muscles, while minimising the swinging associated with curls and their variants. 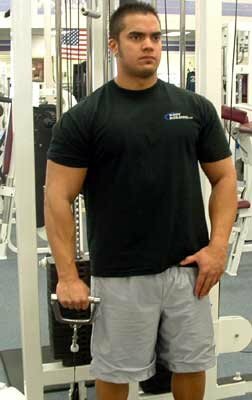 To perform, stand straight while holding a dumbbell in each hand, with hands in a neutral position. Curl one arm at a time, focusing the stress on each muscle in turn. Lower slowly and repeat. For complete muscle symmetry the forearms should not be neglected - a great set of upper arms overshadowing small forearms can throw development off by a wide margin. The reverse barbell curl places a great deal of stress on the entire forearm region specifically, while minimizing involvement of supporting upper-body muscles. To perform the exercise correctly, constant pressure will need to be placed on the forearms: this isolates them possibly better then any other exercise. To perform, grasp barbell with an overhand grip and pin elbows to the side of body to prevent involvement of supporting muscles. Raise weight until upper forearm touches lower bicep. Lower and repeat. A great exercise for isolating all three heads of the triceps (long, lateral and medial), as it places the shoulder joint in a fixed position thereby minimizing the swinging, and possible sacrificing of form that occurs with other forms of extension. 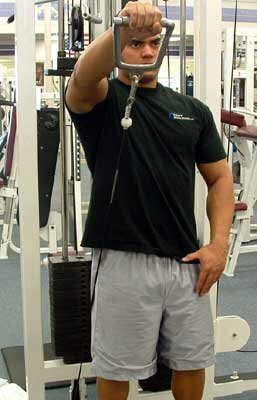 Grasp cable from behind neck while seated (elbow should be positioned upward). Extend arm upward. Return and repeat. Another good option for isolating the triceps is the decline dumbbell extension. 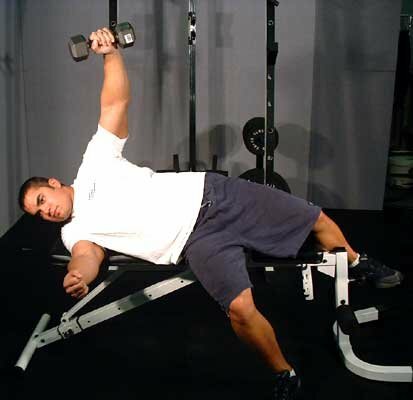 Lie on a decline bench holding dumbbells positioned over shoulders (arms extended). Lower dumbbell slowly until they are positioned alongside sides of head, touching the shoulders. Extend and repeat. Using a leg extension machine, sit in the seat and hook your feet under the padded bar. Adjust the pad and/or the seat so that your knees hang off the end of the seat and the footpad rest on the lowest part of the shins. Grasp the handles on the machine or the edges of the seat to keep your hips from lifting up as you perform the exercise. Extend your legs until knees are straight, making sure you remain seated flat on the machine. Raise the weight all the way, lock and hold briefly, then slowly lower the weight back to the starting position. Get the full range of motion and feel the muscle being worked during the entire movement. Do not SWING the weight up! This exercise really etches detail in all four quad muscles if done strictly. The standing leg curl is one of the better exercises for isolating the hamstring complex - it helps to take the lower back and calve muscles out of the equation. Performed on either a leg extension machine or one specific to this purpose, position back of lower working leg against roller and opposing leg against padding (or roller) on opposite side. Pull roller to hamstring by bending knee. Return and repeat. Another great movement for isolating the hamstrings, the stiff-legged deadlift probably places the most amount of continuous tension on the leg biceps compared to any other exercise. To perform, keep legs straight as the dumbbells are lowered to the top of feet, then lift dumbbells by extending hips and waist to a full lockout. This movement works well to isolate the calves as it allows for complete contraction without excessive momentum from supporting muscle groups. For example, the traditional standing calve raise works as a good mass builder but does encourage the employment of the hips, waist and upper legs. 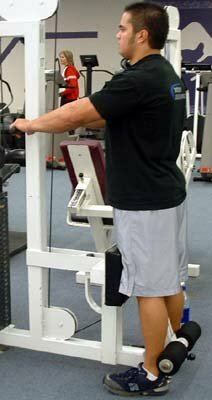 The calve-raise on the leg press machine tends to work the calves alone. 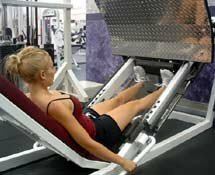 To perform, sit in a leg press machine with the rack raised, while placing balls of feet on rack with heels overhanging. Push the weight up before lowering weight slowly. Repeat. Compared to other forms of abdominal crunch, the cable crunch allows for significant resistance to be generated, as it is a strict contraction movement where weights can be added. It builds the abdominal muscles as it isolates them probably better than any other movement. To perform, in a kneeling position grasp rope attachment from an overhead position and bring to upper chest region, and hold. Keeping pelvis and lower back stationary pull rope toward the floor while crunching the abdominal muscles. 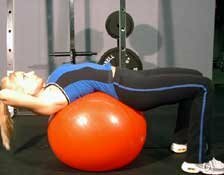 Touted as one of the better abdominal exercises, the Swiss ball crunch is unique in that it allows a deep, full pre-stretch and a significantly greater contraction range than the standard ab crunch. This movement will place the body into an unstable state thereby specifically isolating all the abdominal muscles (including the associated obliques and intercostals). To perform, sit on the ball and walk the feet forward. 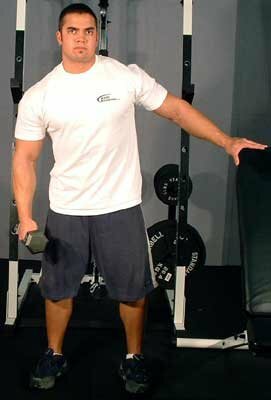 Place feet shoulder width apart and place the hands at the side of head. Tucking the chin in, curl the torso up, directing sternum toward belly button. Lower the torso while rounding the back to finish this exercise. The following routine can be used as part of a bodybuilding preparation plan, or by anyone wanting to improve his or her shape and symmetry. Click Here For A Printable Log Of Monday Morning. Click Here For A Printable Log Of Monday Night. Click Here For A Printable Log Of Tuesday Morning. Click Here For A Printable Log Of Tuesday Night. Click Here For A Printable Log Of Wednesday Morning. Click Here For A Printable Log Of Friday Morning. Click Here For A Printable Log Of Friday Night. Click Here For A Printable Log Of Saturday Morning. Click Here For A Printable Log Of Saturday Night. Click Here For A Printable Log Of Sunday Morning. By incorporating isolation exercises into ones program, a more refined look will likely be the result. Mass building exercises—although necessary for a good muscular foundation—are important first and foremost. However it is also important to feature at least one good isolation exercise per body part per workout to add detail and etch separation. It is hoped this article will have made clear the importance of isolation exercises, and will put you on the road to a better physique.